New fermenter just for small batch brewers! One thing I have struggled with, as a small batch brewer has been fermentation vessels. Try this one this batch and then try this one the next batch, back and forth. For 2 to 2-1/2 gallon batches standard 5 gallon buckets and carboys are really too large. Part of the benefit of small batch brewing is not needing as much space to brew in so a small batch size-matched fermenter would be ideal. Size matched also reduces the amount of headspace, reducing the possibility of oxidation if the vessel is used to secondary ferment in. Other things I want in a fermenter is trub/yeast avoidance when transferring, easy to fit in a small refrigerator for temperature control, being able to see the fermentation activity and not having to siphon. Oh and not having to siphon and if I forgot to mention…I’d rather not siphon. I think you get my priority here. Current choices for small batch brewers are carboys, glass or PET plastic and the old go to…buckets. I’m not a fan of glass carboys due to weight and chance of breaking one, it happened to me once and that wasn’t pretty so we can scratch glass carboys off the list. Next is PET carboys…not bad, light weight, spigots are available to avoid siphoning, and for the most part they unbreakable. Downside to the PET carboy is cleaning. Cleaning is a bit of work since they are plastic and can scratch so a brush is not recommended. Spigots are available in two company’s PET carboys and do work ok but installing or removing the spigots is less than easy. Now there are buckets, cheap and easy to get inside and clean and you can install a spigot if you’d like…downside is anything around 3 gallon in a food grade bucket is hard to come by and you can’t see what is going on inside and that also limits the ability to determine where the trub/yeast is when transferring. What is one to do? Start looking online and do a lot of web searches that’s what. 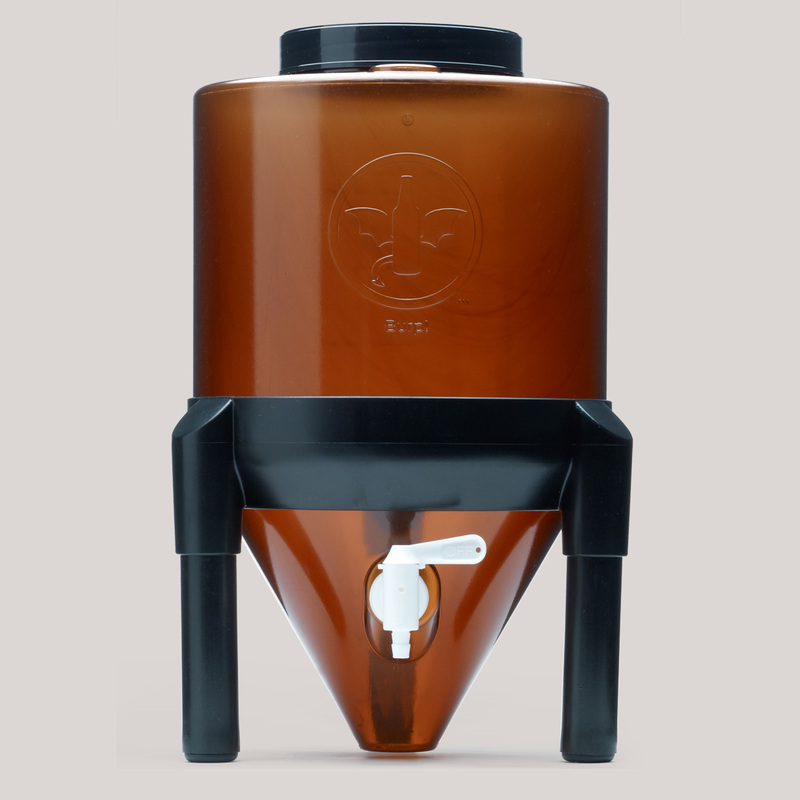 Well I a stumbled on a website belonging to a new small company focusing on small batch brewing called Brew Demon and they offer a 2 gallon conical fermenter with a spigot! I was impressed to find another company focusing on small batch brewing and had to try one of the fermenters but had some questions. I shot them an email with a question and mentioned I blog about home brewing with a focus on small batch brewing and equipment and was interested in trying one. Nick from Brew Demon quickly replied with the answer to my question on a specification detail and actually kindly offered to send me one to try and review here. So here we are and let’s see what the fermenter is like. It arrived well packed and it requires minimal assembly, simply attach legs to stand and put the spigot in. A note of caution, be sure the rubber washer is installed on the outside of fermenter with taper in towards the hole in the fermenter. Snug up the nut on the inside but don’t over tighten. Nice feature is you can easily get your hand inside to tighten the spigot nut without any special tool and the easy access will surely make cleaning easy. Once the spigot was installed I put in some water to cover the spigot and checked for leaks. There was a little drip but I just moved the spigot a little and tightened it a little more. Again, not much force is needed to tighten it enough so it doesn’t leak. I let it sit with water for a while and no leaks. Now a few details about the fermenter. It is marketed as a 2 gallon conical fermentation system but has an actual capacity of just a little over 3 gallons so it is perfect for 2 to 2-1/2 gallon batches. There are molded volume graduations on the side of the brown colored plastic fermenter body, which is a nice touch and will come in handy. The brown tint reduces the effect of sunlight on the fermenting beer yet still allows you to see the activity during primary fermentation. It has a small footprint and will easily fit in a small apartment-sized refrigerator for temperature control if you’d like. The spigot is barbed for tubing. If you use a standard 3-piece airlock (which is available from Brew Demon also) it would be about 20” tall and will fit in an 11” square space. The large screw on lid makes for easy access for cleaning, adding yeast and dry hopping if you like. There is a vent cap that allows CO2 to escape and still keep the nasties out. 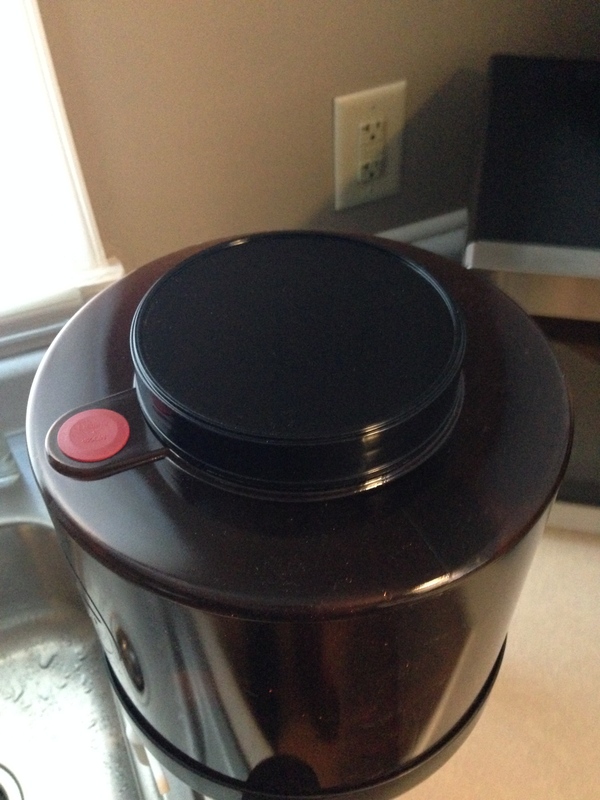 A drilled stopper can replace the cap so you can use a standard airlock. Their “Bubbler Upgrade” comes with the drilled stopper, airlock and a gasket for the screw-on cap to make it airtight so all the CO2 escapes through the airlock. The body of the fermenter can be removed from the stand for cleaning. 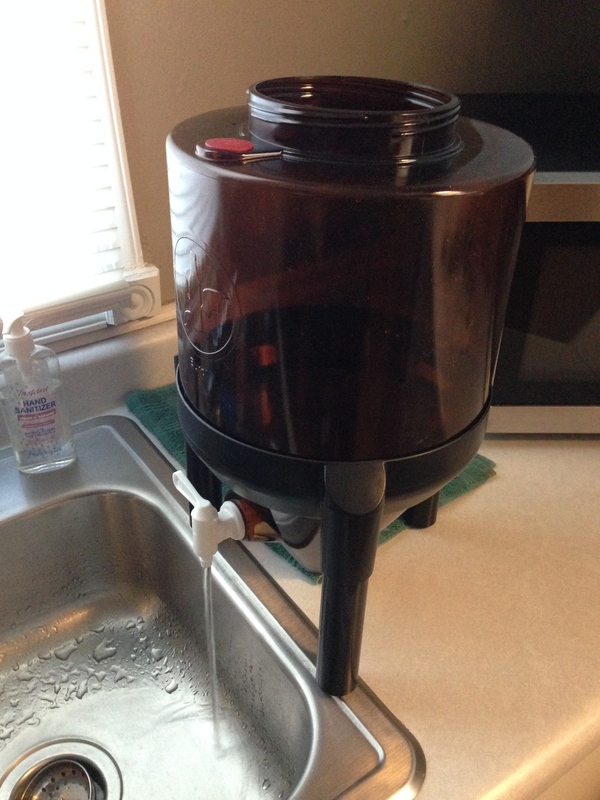 The conical part has space for approximately 16oz of liquid/trub/yeast below the spigot. While it is not a true conical, with a bottom dump valve, small batches would loose too much volume in that process so it isn’t missed. The conical benefit in this case is that it limits the surface area of yeast/trub that the fermenting beer is exposed to which is a big benefit especially for longer fermentation times. Even without using an airlock I was able to see the active fermentation when I checked it 12 hours later. Now to let the yeast do its work in their new conical home. Well after 7 days I decided to take a sample to get a specific gravity reading and having the spigot was awesome, quick and easy. The pale ale was ready to keg and the yeast/trub deposits were well below the spigot and easy to see through the fermenter side. The pale ale finished and I had my keg sanitized and was actually about to grab my auto-siphon when I had to stop myself…we don’t need no stinking siphon! Not having to siphon and still leaving behind all the sediment was awesome and alone worth switching to this fermenter. I simply started the flow to keg slowly to make sure I wasn’t disturbing any of the sediment and the transfer was great. This will be a very clear beer. 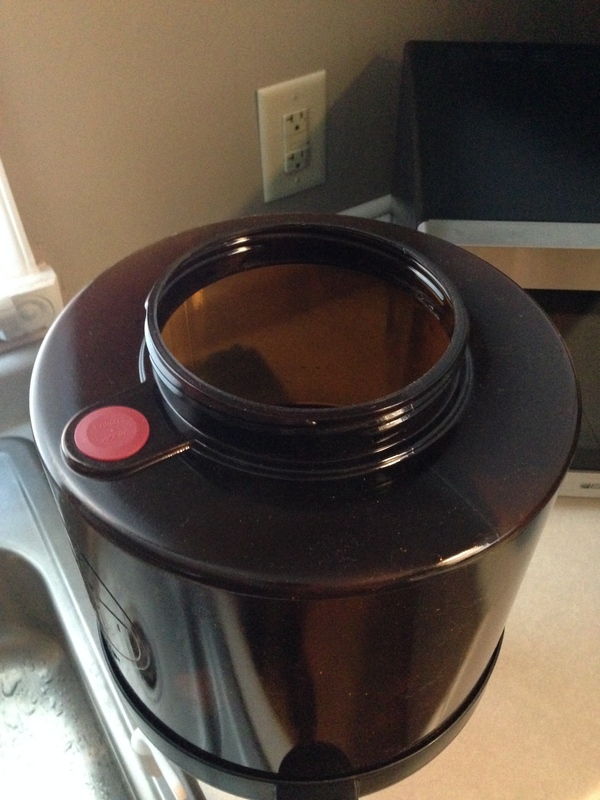 Overall I was very impressed with this simple little plastic fermenter and I am looking forward to fermenting my next batch in it. Truthfully the only con I can see to the Brew Demon 2 gallon Fermentation System is no airlock, but that is minor and definitely not a deal killer. After all, my trial batch finished fine without using one and no indication of infection at all. After fermentation begins the beer is blanketed in CO2, which prevents infection, and the vent plug prevents bad things from getting in the fermenter while allowing excess CO2 to escape. 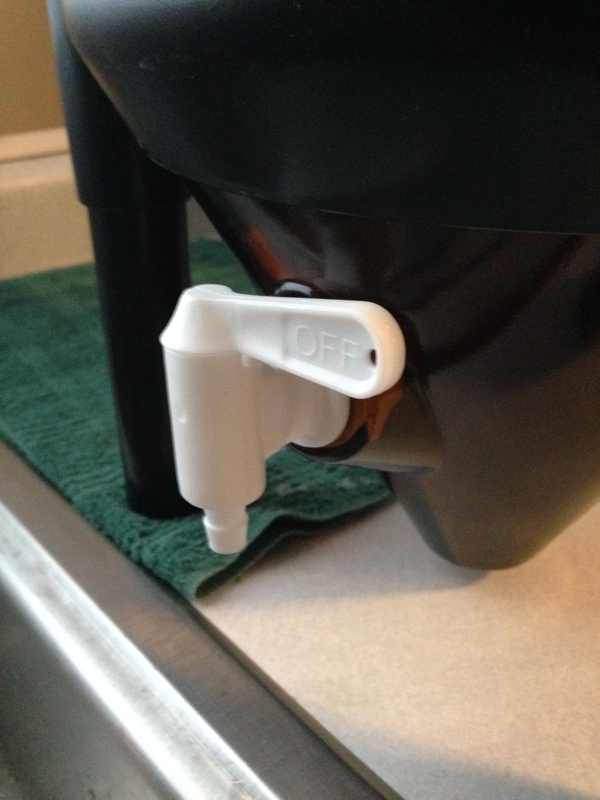 After transferring the beer to my small keg clean up of the Brew Demon fermenter was very easy, I removed the spigot to soak and using a little PBW, water and a dish rag and it was like new. So I would have to give the Brew Demon two thumbs up and recommend new brewers and small batch brewers check out their website. I don’t review many things but I appreciate honest user reviews so it’s easier for us to spend our money wisely. That said I hope this review helps other home brewers. I enjoyed doing this review and honestly like the fermenter. 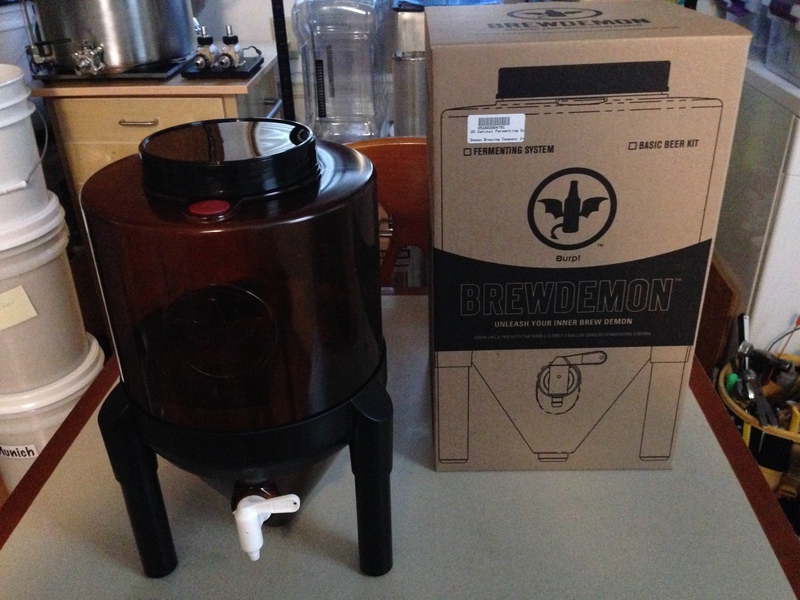 Thanks again to Nick at Brew Demon for sending me the fermenter to try and the great customer support.